Research shows that inadequate language development contributes to weak performance at school, and in later life. Cas Prinsloo and Shawn Rogers explored the relationship between language and achievement in mathematics and science, as revealed in an initial analysis of the 2011 Trends in International Mathematics and Science Study (TIMSS). A number of items in TIMSS dealt with language. We undertook an initial analysis to establish whether there were possible associations between language factors and mathematics and science achievement. This article refers to only some of the findings in this regard. Complex modelling and analysis will take place at a later stage. African home-language speakers who are taught in either English or Afrikaans at school. English and Afrikaans are the only official languages of learning and teaching after grade 3. When the learners’ home and test (instructional) languages were similar, they achieved much higher scores compared to learners whose home and school languages were different. The score difference was 120 points for science, which meant the latter group performed three grades below the standard, while for mathematics the difference was 80 points, or two grades below the standard. These observations confirmed the importance of learning and being tested in one’s home language, but also the likelihood that the effect in performance was language related. This could be seen in the fact that the effect on scores for science, which is more language dependent than mathematics, was much higher. Figure 1 depicts this potential language influence. 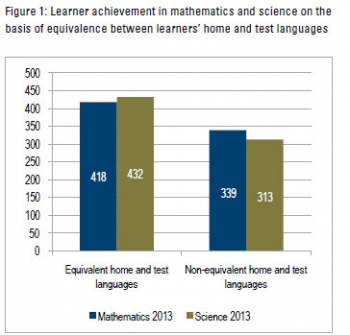 This observation was further substantiated by the finding that the science scores of learners with the same home and test languages were higher than their mathematics scores. However, in instances where the home and test languages were different, learners’ mathematics scores were higher than their science scores. Using the same home language at home and in the test applied only to the first two groups identified earlier, while the impact on children in the third group (that speak an African language at home) was negative – and this applied to just over 80% of learners who were assessed. At least part of this language effect originates in primary school, or even before, when a great deal of conceptual and cognitive development takes place. Irrespective of the equivalence between learners’ home and test languages, some learners have greater opportunity to speak the test language at home. This would have great benefit for learners with African home languages. Findings revealed that learners that always or almost always spoke the test language at home, outperformed those learners who never did by 141 points for science and by 84 points for mathematics respectively. This observation confirmed the importance of exposure to the test language outside of school – and this applied to only 25% of learners. The percentage included the 5% of children who spoke an African language, but who were also exposed to English or Afrikaans outside school. Homework was assumed to expose learners to extended writing opportunities. Therefore, learners that did more homework were expected to achieve higher marks. This was not the case. A small effect was found for mathematics only. Learners that did mathematics homework three or more times per week for 15 to 60 minutes at a time achieved at most 40 points more than those learners doing no, or very little, homework. Also noteworthy was that the higher the level of education of learners’ parents or caregivers, the better they performed. There was as much as a 90-points difference in mathematics scores and a 120-points difference in science scores between pupils whose parents had the highest qualification and those with the lowest qualifications. This suggested that children growing up in a culture of learning, reading and writing, surrounded by books, harvested rich school achievement dividends. Finally, some indications showed the influence of access, support and constraints of how learners’ exposure to language could enhance their mathematics and science achievement. Ratings provided by principals and teachers strongly confirmed the impact that instructional material and textbook shortages and inadequacies have on instruction. A range of commodities at home also seemed to have played a moderate part compared to home- and test-language equivalence. These included the number of books in learner homes and access to computers (for only 35% of learners), the internet (31%) and television (88%); the latter especially in relation to their science scores. Access to the language basis of the mentioned commodities should therefore not be underestimated with regards to preparing learners further for their school work, especially when it comes to test languages. It has become a platitude that language development is crucial for all other learning to take place, and this brief analysis again confirmed this. It also indicated where some crucial and concrete interventions should be implemented, for example, aligning learners’ home and school languages much more strongly, right from the start, and for a much longer period. This has to be based on the premise that language teaching and learning in both learners’ first and additional languages have to be fully competent. This not only applies to the contents taught in the two subjects, but also to how these contents are conveyed by skilled teachers (didactics). In addition, our country has to do all in its power to ensure that all learners have access to the conditions and commodities conducive to providing them with broad language exposure and proficiency. Authors: Dr Cas Prinsloo, Chief Research Specialist, Education and Skills Development (ESD) research programme, HSRC, and Shawn Rogers, PhD intern, ESD, HSRC.